Between the symbolic Noon and Sunset of the cycle of being the fundamental goal of evolution is the consummation of the "divine Marriage" of spirit and matter within a human being. In this union of opposites, the all-encompassing meaning of Wholeness is revealed in a moment of Illumination, in a moment of dynamic equilibrium in which the principles of Unity and Multiplicity are of equal strength. The union must be contained within a form that can resist the union's intense "heat" and not be shattered by it. (1) This form is the mind of wholeness � a mind totally filled with the harvest of a long series of life experiences that were spirit oriented yet rooted in the substance of earthly existence. When this mind reaches a perfected state of development, karma is fulfilled; the distortions brought to the harmonic and serene Movement of Wholeness by a series of human personalities during their life spans � their "sins" of commission and omission � have been harmonized. 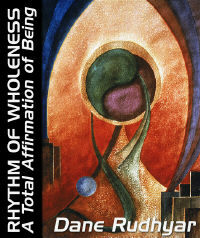 (2) In the ultimate moment of Illumination and within the integrated formations filling this mind of wholeness. Wholeness is Meaning. The full meaning of the Image of Man conceived in the previous Godhead state is understood. It is one vast, all-inclusive meaning; or as occult and mystical traditions say, Man is potentially not only the microcosm of the objective manifested universe, but also the alchemical vessel within which all the powers of the symbolic Day and Night of being can find themselves harmonized in their essential nature, which is both spiritual and material. Man is potentially the complete manifestation of Wholeness. To be such a manifestation is Man's dharma, and the field for such a manifestation has to be given form by the mind of wholeness � the mind illumined by spirit, thus by the Compassion that radiates from the Godhead state in which the principle of Unity reaches the apex of its power (in Sanskrit, manas taijasi, the illumined mind). While the forms built by this mind are such that in them the principles of Unity and Multiplicity can reach their harmonized expression, the energy animating these forms is the power of Compassion. Spirit is the active factor in them; for at whatever level it operates, spirit is rooted in Compassion and the will to inclusiveness. Compassion provides the incentive to build a new dharma to balance and harmonize any ancient karma � dharma and karma being two complementary aspects of Wholeness. Mind builds the archetypal forms of dharma. Each archetype structures an invisible "field of forces" within which spirit seeks to establish a definite and steady relationship with a particular human organism, produced according to the laws of nature operating in the earth's biosphere. In my book The Planetarization of Consciousness, I called such a field of forces the "ideity field". (3) This field acts on the great variety of cells and organic functions in a human being, functions which seek to hold the attention and draw to themselves the power of the central self. In this field, spirit as Compassion and the drive toward unity seek to affect this aggregation of desires inherent in the state of biological and psychic existence. This state of existence is what the popular mind understands as life, but this is because Western mentality has refused to see in life a universal power that is only for a period focused upon and pervading a fecundated ovum (or vegetable seed). Sri Aurobindo referred to that condition of biological existence and its multifarious desires as "the vital." In some manner, integrative spirit and the too often discordant voices of the vital have to meet and come to terms with one another. Mind, in its individualized aspect, builds the ideity field to provide a meeting ground. But at first mind must deal with the basic biological drives of the organism whose existence must be assured and perpetuated. This biologically dominated mind becomes at the human level of existence the "lower mind," for which a better term is the concretizing mind. Another type of mind, however, operates at an existence-transcending level. It usually is called the "higher mind," the builder of archetypes. It gives a definite form to the dharma of the individual person. The "body of individuality" I mentioned at the close of the preceding chapter is, in principle, the manifestation of this archetype; but it is such a manifestation only when the individual performs his or her dharma. In the early stages of the process of individualization, the ego often usurps the power essentially belonging to the true self; when this occurs the "body of individuality" (or mental body) is "fed" mainly by the concretizing mind intent on sorting, generalizing, assimilating, and conceptualizing the experiences of personal and sociocultural living. These experiences are conditioned by the desire (kama) for a multitude of relationships with objects and other persons � relationships which are mostly acquisitive and possessive. In its archetypal aspect, the "body of individuality" is presumably what is known in Hindu philosophy as karana sharira and among Theosophists as the causal body. The term body, however, is confusing because it gives the impression of a well-organized system of activities endowed with some consciousness of its own; in most human beings today, the "body of individuality" is barely organized. Even the "body of desires" (or astral body) usually is not a field of activities sufficiently well organized for a centralized consciousness to operate objectively in it � as objectively as the ego can operate in a physical body. An effective type of organization requires a strong, active, form-building, and organizational mind. At the level of the desires for existential relationships � with their ups and downs and their inherently dramatic as well as aggressive character � the organizing factor is the concretizing (or "lower") mind. It is the intellect (in the modern sense of the term), which both systematizes and conceptualizes the experiences of the body and the psychic level of the personality and gives them meaning. It does so by referring these experiences either to the collective tradition and life style of the community or to the established character of the personal ego. The ego in turn is rooted in the biological temperament of the person and its particular balance of functional activities and needs. For a "higher mind" to develop effectively, the spiritual entity to whose purpose this mind would be consecrated has to have reached a point in its unfoldment at which it can focus its energy � the energy of Compassion � in the direction of a particular human organism. But the achievement of a one-to-one relationship between a particular human being and spiritual Quality also requires that mankind as a whole (the biological species homo sapiens) has reached a certain stage in its physical and (through a series of culture-wholes) psychic evolution. The attainment of this stage makes possible the birth and development of human beings sufficiently sensitive to respond to the "call" of a spiritual Quality � a call that must be formulated by the higher mind. In other words, the process is twofold and involves a "descent" (or the involution) of spirit into a well-defined organization of mind and the "ascent" (or evolution) of living forms toward not only a fully human but a definitely individualized state. These opposite currents meet at the level of mind; but because mind has a basically neutral (that is, nondirectional) character, a human mind finds itself divided by a twofold task: it must contribute well-defined structures to both the descent of spirit and the ascent of biological systems spawned by the earth's biosphere. The usual result is that a human being is divided into two systems of activity and consciousness. These systems are popularly called the "higher Self" and the "lower self," and Christian tradition has long featured the concept of human nature as a precarious union of angel and beast. These two aspects interrelate and often confusingly blend at the level of mind. Actually, mind represents a third factor in addition to the duality of spirit and matter (which has been overly emphasized). Because of mind, the opposites can be harmonized and eventually united, after a long process of preparation and many repeated attempts. Thus Man's organization is actually triune, and each of the three components itself has a threefold character. Nevertheless, for practical purposes today, the dual nature of human beings may be more apparent. The most fruitful approach combines the two concepts: while it gives to mind a pivotal, all-important character, it also deals squarely with the realities of human existence and the often hidden cause of many deep-seated inner conflicts.